The Neuköllner Oper Kinder Klub starts this time with old and new members aged 8 to 16. In the last season we recorded a serious theme, which “the big ones” also dealt with in the regular season schedule (WOLFSKINDER). What is a world without parents like? First an adventure and almost unlimited freedom, but then of course also fear and loneliness. What could be done about it? Does the merger into a group help? And how can you decide where to go? A group of 12 girls and boys met on six weekends on Saturdays and Sundays and developed the play ALLEIN with all the means of music theatre, which was first presented to friends and relatives and then presented at the art and culture festival “48 Stunden Neukölln” on 24 June 2018. … and what was 2017? The “Oldies” (12-15 years old) have successfully premiered their new production Taylor. Together with the “Neuen” (8-11 years old) they performed the piece again in public at the festival “48 Stunden Neukölln” (June 25, 2017 – in our new rehearsal room, the Remise in Uthmannstraße 12). On six weekend afternoons, the children last invented music, movement and play for a play under the expert guidance of Lajos Talamonti and Michael Kessler, which they then presented on our stage: The forest of the enchanted children – a mini-magical as part of the art and culture festival “48 Stunden Neukölln”. There is further information with Benjamin Stein under 030/6889 0713 or under stein@neukoellneroper.de. As part of the Berlin Mondiale project initiated by the Berlin Council for the Arts and the Berlin Council for Refugees, the Neukölln Opera has developed the MISSION B project. In the second year, it was developed together with 7-12-year-old children from the transition dormitory Radickestraße (IB) in Adlershof. The focus of the work was on fairy tales with their interculturally common protagonists. In the third year there are workshops aimed at refugees: In terms of content they deal with roles: Which images of the other are there in me or with the others, how can I playfully deal with them. This form of encounter is currently being continued by supplementing the workshop format with public events with a cultural reference (music, literature, etc.) developed by the women working together in the workshops. These events take place in the rooms of the Neuköllner Oper. This project is led by the theatre pedagogues Kristina Roehl and Helena Klaßen. 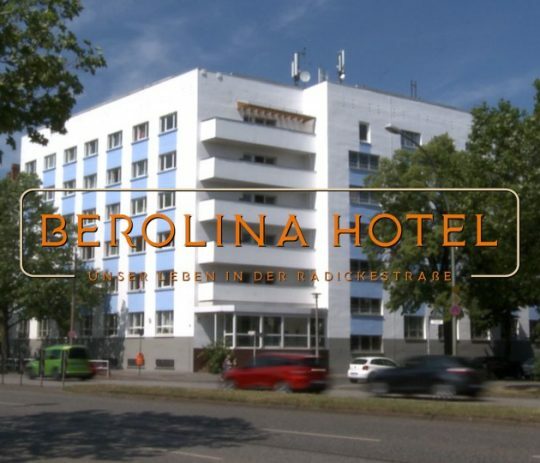 In addition, a film entitled Berolina Hotel was produced about the everyday life of home residents in the IB Radickestraße temporary dormitory, the script of which was developed by Afghan filmmaker Ghafar Faizyar together with home residents*and staff*. The public film premiere took place on 3 November at the premises of the cooperation partner Alex-TV. The film can be seen here.